Warm and cozy, Matzo Ball Soup always fills you with warm fuzzies. This version is easy, uncomplicated, and perfect for beginners. Mince the garlic and dice the onion, celery, and carrots. Sauté the garlic, onion, celery, and carrots with the vegetable oil in a large pot over medium heat until the onions are soft and transparent (about five minutes). Add the chicken breast, chicken broth, 2 cups water, some freshly cracked pepper, and one or two sprigs of dill to the pot. Place a lid on the pot and let it come up to a boil. Once it reaches a boil, turn the heat down to low and let it simmer for 30 minutes. While the soup is simmering, mix the matzo ball dough. In a medium bowl, whisk together the eggs and vegetable oil. Add the matzo meal, salt, baking powder, and a little freshly cracked pepper to the eggs and oil. Stir until well combined. Finally, add 3 Tbsp water and stir until smooth again. Refrigerate the mixture for 30 minutes to allow the matzo meal time to absorb the moisture. After the chicken soup has simmered, carefully remove the chicken breast and shred it with a fork. Return the shredded chicken to the soup. Taste the broth and adjust the salt if needed. Once the matzo ball mix has refrigerated and stiffened up, begin to form it into ping pong sized balls. Drop the balls into the simmering soup as they are formed, returning the lid to the pot after each one. 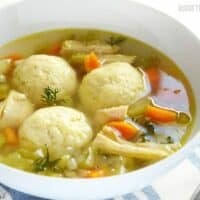 Once all the matzo balls are in the soup, let them simmer for 20 minutes without removing the lid. Make sure the soup is gently simmering the entire time. Add a couple sprigs of fresh dill just before serving. *My chicken breasts were on sale. You can use boneless, skinless or bone-in and skin on. Bone-in gives the best flavor, but be sure to remove the skin before adding it to the soup. The bones can be removed when you shred the chicken. **I use Better Than Bouillon to make inexpensive broth in the exact quantity that I need.